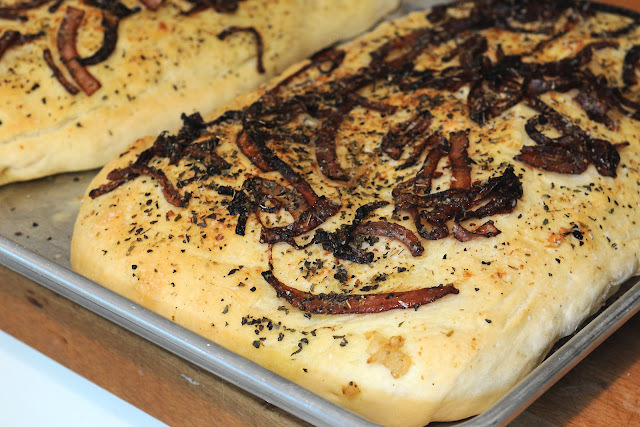 I am so excited to be sharing my recipe for focaccia bread with Sumptuous Spoonfuls. Ann is wonderful and she has always been so supportive of my blog and photography. This is the post that I shared with her last month. ENJOY! It will be one year in June when I started my blog, Simply Gourmet Photography. I have been taking pictures for a long time and just happened to be asked to work with some amazing companies as a food photographer. I recently moved to MD and was needing a change, so I started the blog with the hope that new opportunities would come my way and they have. I am now a writer for one of our local magazines and I enjoy it very much. I still get to take pictures, develop recipes and write. One thing that I love about Ann's recipes are they are fresh. I love her salads the most! She has inspired me on more than one occasion to create a fun salad and dressing. What better accompaniment to a salad than a fresh loaf of bread. I love bread and I make bread a lot for my family. I have easy one hour recipes and then I have the all day, double rise, let sit over night recipes. I enjoy them all. I love the way the dough feels in my hands after it has risen, so soft and airy. I find the process of making bread creative. There are so many types of bread, toppings, flours and styles. You could never get bored with making bread. 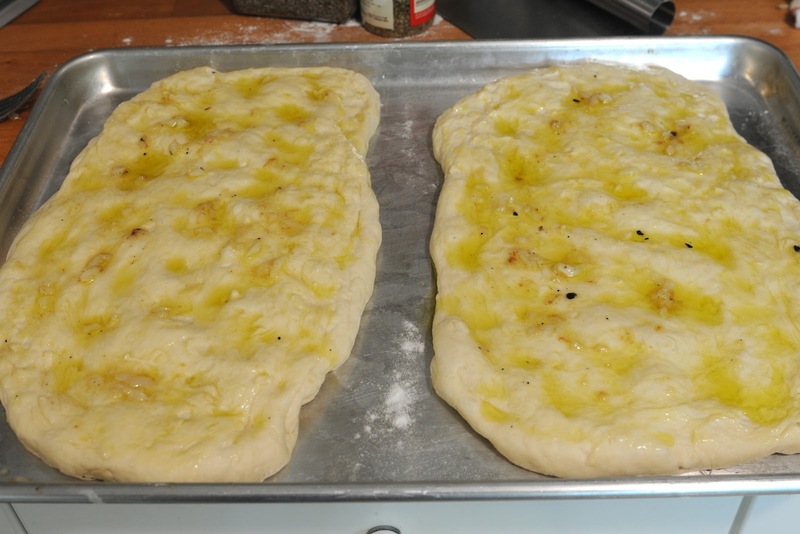 This recipe for focaccia has been made numerous times for my family. I especially like to make it for sandwiches and big parties. It makes two loaves and the options for toppings are endless. This flavor of the caramelized onion and grilled garlic is my favorite. I will make this focaccia and use the bread for French Dips. It holds up great for a sandwich and the onion/garlic combination compliments the beef well. In a large saute pan, add oil. Add the sliced onion and cook over medium heat. The onions will start to turn a light brown and then gradually become darker. If you need to add a bit more oil go ahead. You don't want them to get dry. When the onions are dark brown, add your splash of red wine. This step is optional but it does add a deep rich flavor to the onion. Continue cooking until the onions are dark, not burnt. 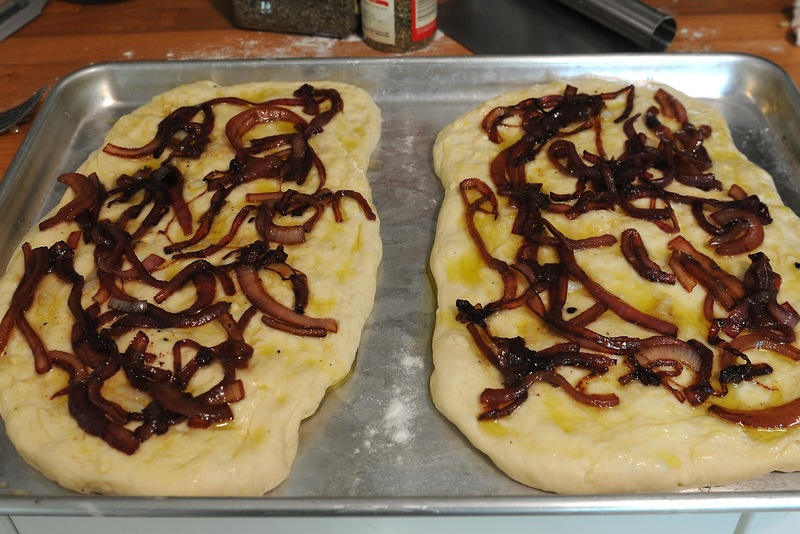 The process takes about 25 minutes depending on how many onions you have. If you only use half of the onion, the cook time may be shorter. Cut the ends off of each garlic bulb. Brush the ends with the olive oil. On your BBQ, set your grill to 350 and grill the garlic until browned on both sides. They should be done at around 15 minutes. I try to do a bunch at this time and then store the extra's in the fridge. When they are cooked, I remove the cloves and smash into a small bowl with 4 T. of olive oil, this will be used on the focaccia bread. Prepare the yeast by add the water, yeast and sugar to a small bowl. Set aside for 5 minutes until it starts to bubble. If your yeast does not create a foam/bubbly top then you may need to start over. In your Kitchen Aid mixer with the paddle, add the salt, 3 cups of flour and 2 T. of olive oil. Start to mix together and add yeast mixture. Mix well. Let rest 10 minutes. Change from the paddle to your bread hook. On medium speed, add a 1/4 cup of flour at a time until the dough forms a ball and no longer sticks to the bottom of the bowl. Because my humidity is so high I usually end up adding more than 5 cups…just add it in 1/4 cup increments and you won't add too much. Knead in your mixer for 7 minutes. Move dough to an oiled glass bowl and let rise until double. When the dough has doubled, turn onto a floured surface and knead for one minute. Cut dough in half. Prepare your cookie sheet. Spray or oil the sheet then sprinkle some cornmeal across the cookie sheet. 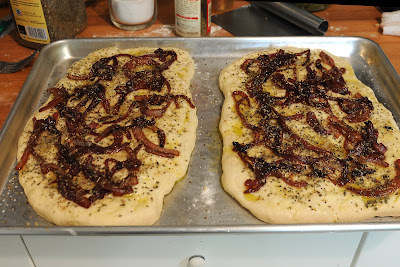 The two focaccia loaves should fit side by side on your cookie sheet. With your hands pull and push the dough into a small rectangle to fit on half of the cookie sheet. Leave an inch in between the two loaves. It will be uneven, this is okay. It should look like little hills and valleys over the top of each loaf. 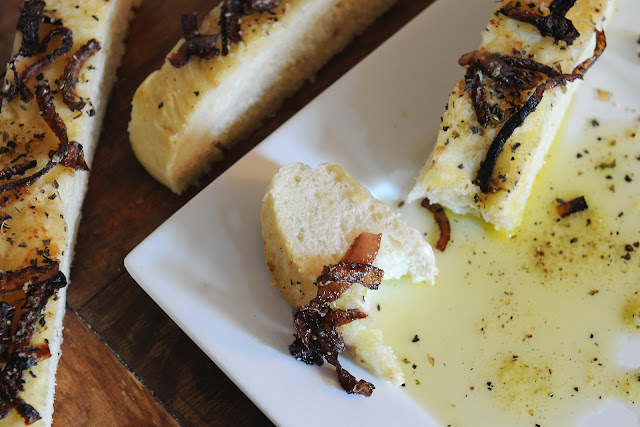 Take a pastry brush and brush the olive oil and grilled garlic over the top of both loaves. It will pool and look like a lot, this is okay as it all cooks into the focaccia. Let sit for 15 minutes. Next, add the caramelized onions. The final step is adding your herbs and coarse salt. I used dried herbs in this recipe. I sometimes use fresh and I love that too. I usually use an Italian spice blend or you can use oregano, rosemary, basil and thyme. Bake the loaves for 20 minutes. 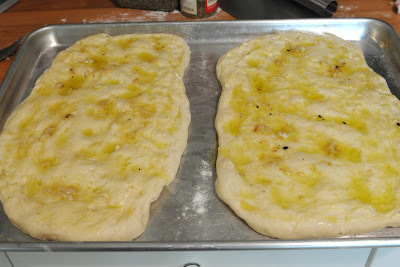 The focaccia bread should be golden brown. We slice ours into 1 inch chunks. 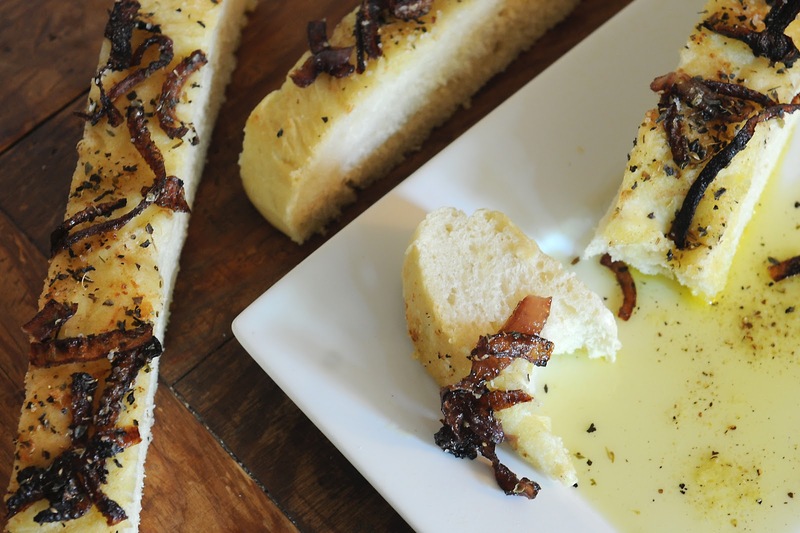 I often times serve the focaccia with a dipping mixture of: extra virgin olive oil, parmesan cheese, Italian herbs and salt. My guest love it!